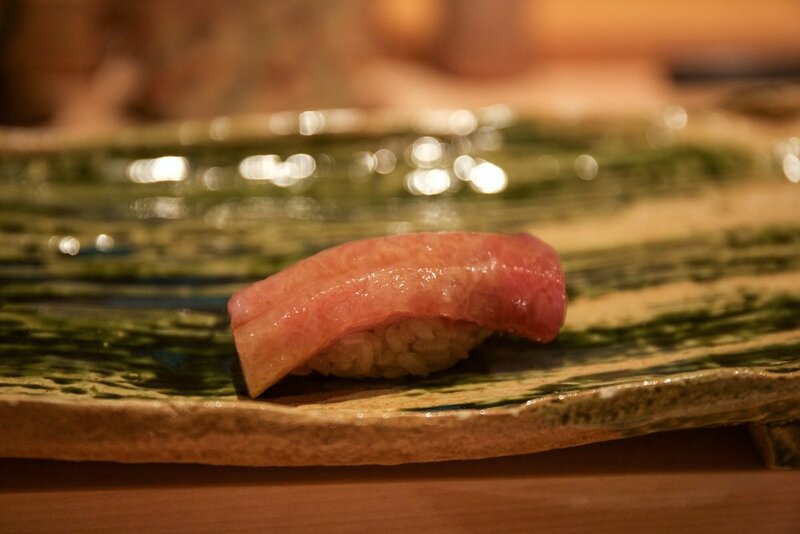 We have all heard this before: "OMG the o-toro was so buttery melt-in-my-mouth and so flavorful! It was soooo fresh I'm sure it was swimming this morning!" If served too soon after the catch, many fish (tuna included) will have very little taste, with no umami flavors present, and will also have an unpleasant, tough and chewy consistency. Granted, a lot of seafood is best when consumed as fresh as possible. Shellfish, for example, need to be very fresh in order to taste great and be safe for raw consumption. Hikarimono, such as sayori, aji, iwashi, and saba have a very high oil content, and because of this they can spoil very quickly and must also be very fresh to be consumed nama. But many tane can greatly improve in both taste and texture when aged. Maguro, as mentioned, is best aged. Flavors continue to develop when aged for a week or more, with chefs sometimes aging tuna for up to fifteen or more days. And most shiromi fish, including tai, hirame, and buri benefit from two or more days of aging, again depending on factors such as fat content and size. The process for aging fish is similar to aging beef. The fish is typically gutted and cleaned first (although this is not always the case, again depending on the type of fish) and it must be aged in a controlled environment (typically a refrigerator) where both the temperature and humidity levels can be carefully monitored. The fish meat will usually be wrapped in cloth or paper towel which will absorb moisture released during the aging process. The procedure must be closely monitored on a daily basis, and the cloth or paper towel changed frequently. Care also needs to be taken to prevent the meat from oxidizing and turning brown in color, although some oxidation is unavoidable. What chemical process actually takes place during aging, and why does it improve flavor and texture? Simply put, enzymes located in the muscle cells of the fish break down proteins, fats, and glycogen into sugars and different amino and fatty acids. Have you ever noticed how fish can have wonderful umami flavors? This is because one of the amino acids that is generated in the aging process is glutamate, one of the component of MSG responsible for umami. So new flavors (umami, sweetness, some bitterness) develop during the aging process, and since moisture levels are reduced in the process, these flavors are concentrated. And another wonderful side effect of the enzymes' work is that the texture of the flesh becomes softer, less chewy, and more palatable. So why don't all sushi restaurants age fish when appropriate? The reason is simply that aging fish correctly requires a lot of experience, skill, and expertise. A lot can go wrong, resulting in spoiled product. Correctly aging fish to bring out its very best flavors and attributes is one of the telltale signs of a true sushi master.